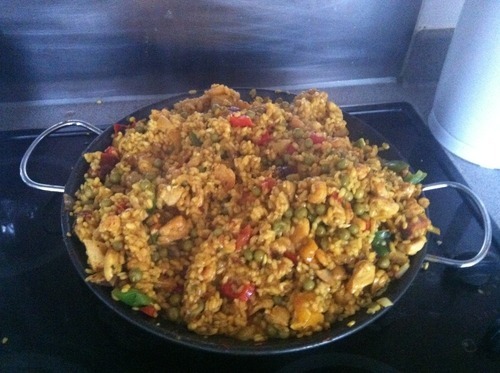 I am a BIG paella lover, to the point that I could eat it every day. The dish itself is so simple and the flavours are absolutely delicious. I cooked for my four close friends and they always joke about my cooking, but none of them realise how much I’ve experimented over the past year or two and that I’m actually pretty alright now (blowing my own trumpet a little!). So I decided on paella as it is simple, can be left a little while I disappear for a glass of wine and a chat and it can be served from the middle of the table. I have to say, it went down very, very well and the thing about paella is that you can vary it as much as you like - all meat, all seafood, all veg or a mix of everything. My paella pan was only a cheap one from TK Maxx to as they do reasonably priced, good quality kitchenware, so you can probably pick one up for less than a tenner! I fried everything seperately in a frying pan too before popping it in my paella pan to ensure the meat was cooked. First of all I precooked my chorizo under the grill. You can use fresh from the deli counter chorizo but this stuff is so simple and can be grilled in under 12 minutes with no faffing around. While the chorizo is grilling, fry your chicken in a little bit of oil. When it’s nearly done, bang in your chopped vegetables (onions and peppers first as they take a bit longer, then mushrooms etc). Add the crushed garlic cloves and fry everything until soft. 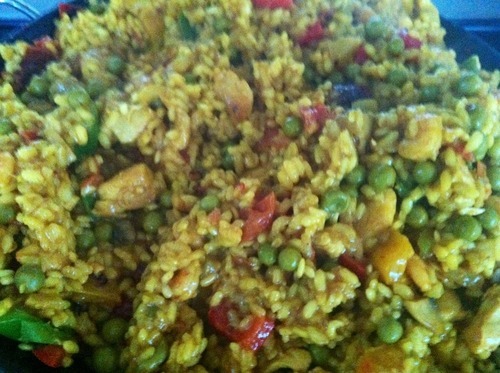 Transfer everything into your paella pan then add the paella spice and chicken stock, followed by the paella rice. I find if you add a little chicken stock at a time (as with risotto) it makes the rice soften easier. If you have to keep adding a little water, don’t worry, but don’t go too overboard as it will affect the taste. After a few minutes I add the rest of the paella spice. After a few minutes I add the prawns and cover the pan over (with foil) and turn down to a low heat so the stock simmers. Stir every now and again but leave for 20-30 minutes to soften the rice. Add the garden peas almost at the end as they don’t need too long. Test the paella for dishing up just to check the rice is done. I served with a lemon cut up into chunks on the edge of the paella pan and a couple of wedges per plate. Nothing is better than a bit of lemon juice on paella, mmm! Voila! Be prepared to have some very happy and satisfied friends.